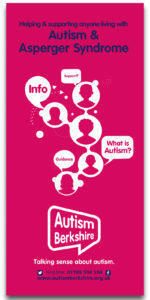 We offer a range of information and advice to parents, carers and families of people living with autism of all ages. We run weekly drop-in advice sessions during school terms at our office in Reading, at the YES Shop in Slough’s Queensmere Observatory Shopping Centre, monthly drop-in sessions at Swings and Smiles’ coffee mornings in Thatcham, and a number of free support groups for parents and carers, with visiting speakers. We also provide a comprehensive range of training workshops for parents and carers. Members of Autism Berkshire have access to our library, and can borrow books offering advice on topics that those caring for children and young people with autism spectrum conditions, including education and access to employment. We have recently updated our library’s stock with support from the Local Transformation Fund for Children and Young People’s Mental Health and Wellbeing from the East Berkshire and Berkshire West NHS Clinical Commissioning Groups. Please visit our office, have a cup of tea or coffee and borrow some books. 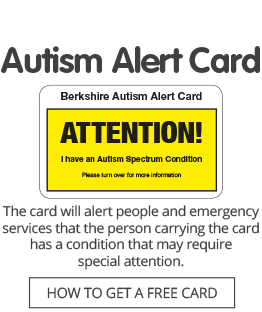 We also administer the Berkshire Autism Alert Card scheme, which helps people living with autism to quickly and easily explain their condition to others if they become anxious or stressed while out and about. Our Useful Links page provides signposts to a range of online resources, such as local authorities, health services, education and information about benefits. Professor Tony Attwood’s website offers a useful guide for parents, people with Asperper’s syndrome and their partners. You can also download our Help & Support leaflet for further info, by clicking here or on the image.